Diwali 2018 is going to be celebrated next week on Wednesday, October 7, 2018 and we all know what that means- a flood of sweets and savoury delights in the markets. Sweetmeat sellers and confectioners will soon start working overtime to meet the increased demand for fresh sweets in India and around the world. From ladoos to barfis, fried snacks to halwas, there’s a wide range of Indian festive sweets. 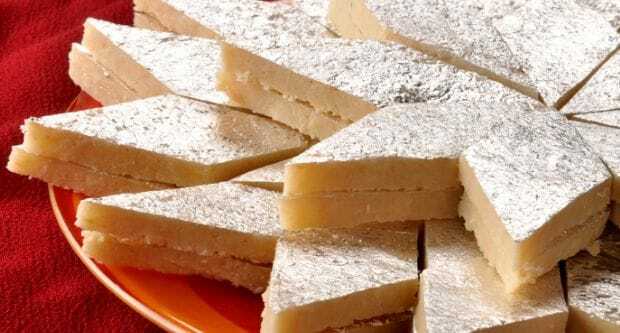 Kaju Katli or Kaju Barfi is one of the most-loved Indian sweets, that is widely sold during the time of Deepavali. It is not only popular among people in the Indian subcontinent, but is also loved by people in the neighbouring countries of Bangladesh and Pakistan. Huge decorative boxes of kaju barfi decorated with silver leaves will soon start making appearances on the shelves of Sweet Marts across the country, as well as in the refrigerators in our homes too. But did you know that kaju katli is also one of the most widely adulterated sweets during Diwali? Kaju Barfi, which literally translates to ‘slice of cashews’, is made using cashew nuts which are soaked in water for a long period of time and then ground to make a paste. This paste is then mixed with ghee, milk, sugar, kesar and other standard sweet ingredients. Once the mixture is cooked, it is spread on huge steel and brass platters and allowed to cool, before it is cut into bite-sized and diamond-shaped sweets that are just irresistible- we bet you can’t stop after eating just one piece! It’s easy-to-make and can be prepared very quickly as well. But a lot of people are not aware about just how easy it is to make kaju katli at home and most of us end up buying these barfis from the market. When you buy sweets from the market, they often tend to be made from substandard, even adulterated ingredients like poor quality milk and khoya. This is why these store-bought sweets can be unhealthy for your loved ones. Additionally, these sweets are not made to order but are made in bulk and sometimes customers are sold, old and stale sweets too. On the other hand, if you want to treat yourself and your family and friends to something fresh and healthier, you can make kaju ki barfi or kaju katli at home as well. Chef Niru Gupta has a simple and classic kaju katli recipe, involving very few ingredients that can be relied on, for a delicious batch of homemade sweets. Try the recipe to enjoy some fresh homemade kaju katlis this festive season!